While doing research for our recent 4 part summary of 2013 market forecasts, I noticed that few analysts or prominent writers believed the EU it would present major trouble in 2013. EU officials have attempted to reinforce this complacency in recent weeks. EU commission President Juan Manuel Barroso, and France’s PM Francois Hollande both (see here and here) recently declared the EU crisis over. Even German finance minister Schaeuble, who not long ago said the worst was yet to come, is now saying the worst has past, although virtually nothing new had occurred. As we’ll discuss below, these claims seem odd for those who are fully aware that the GIIPS economies are not healing, EU unemployment just hit a record and that both Greek and Spanish banks remain undercapitalized for the foreseeable future, and plans to help them are based on the dubious assumptions that the loans will be repaid and terms will be honored. Still, it seems that as long as GIIPs borrowing rates low markets will continue ignoring EU risk. Given how little has in fact changed since ECB President Draghi’s promise of unlimited GIIPS bond buying, this complacency seems unjustified. So here’s a reminder of why the EU crisis isn’t nearly as under control as markets appear to believe and why events surrounding it, rather than those in the US, China, or Japan, remain the likely big market driver in 2013. Except for greater ECB willingness to buy GIIPS bonds and print money (per Draghi’s own implied admission, these are just steps to buy time to make the changes noted below), everything that’s been wrong remains wrong. The EU’s voters, as perceived by their leaders, haven’t chosen between retaining control over their budgets (and hence sovereignty), and ceding it in order to get the unified control over national budgets. Nations who can’t repay their debts won’t repay them. Period. The only real way out is debt forgiveness and acceptance that, as in the US, wealthier states must accept long term transfers of wealth to poorer states. See here and here for some good pieces on this topic by Cullen Roche. At the same time, citizens of debtor states need to accept that in return for financial aid they will have to forgo much of their welfare state benefits. In sum, the EU still isn’t ready to make the hard decisions needed to achieve the fiscal and monetary integration needed to insure debts get paid and a similar crisis doesn’t reoccur. It took the US about 100 years and a civil war to unify, and they didn’t have the obstacles of language, culture, and a history of hostilities to overcome. That means different states respond differently to the same reality. Some are more able than others to make sacrifices now for the sake of the future, produce more, etc. True better communications and other technological advantages of today can help overcome those obstacles faster. However the EU has been hitting solvency issues every few months. We don’t know how long the above routine can continue, but it’s likely at best limited to a matter of years, not decades. Meanwhile there’s no real progress and the GIIPS economies and banking systems are either stagnant or deteriorating. That’s true in general for the GIIPS. Let’s look at a few individual nations’ highlights. In the first half of 2012, Prime Minister Rajoy denied that Spain’s banks were in trouble. Then, one of its largest banks revealed that both its financial statements and profits were utter fabrications. He then demanded a €100 billion bailout, playing the same contagion threat (but much worse given the size of Spain) that has worked well for Greece, and then announced that Spain’s economy was in big trouble. 3) Hand over fiscal sovereignty to the EU. Not surprisingly, Spain has yet to even begin negotiating on these conditions, setting up another potential crisis when Spain needs the program, as we’ve discussed in the past here. So all the OMT has been thus far is verbal intervention, a big bluff that has managed thus far to get Spain bond rates lower. However even that bluff hasn’t been all that effective, because it turns out that most of the ‘successful’ Spain bond sales have been to … Spain, which has used about 90% of its pension funds to buy these bonds over the past 2 years, so that source of funding is mostly exhausted. Last year Spanish banks were the main buyers of Spain bonds. Guess what they’ll be using that bailout money for? In other words, markets are calm about Spain because they believe in a solution that’s likely to fail as badly as similar measures have for Greece. The best likely result is another temporary ‘solution’ like that described above. At some point the markets will wake up to the reality that the EU hasn’t got a long term solution. At that point, the EU may be out of time. Spain needs to sell about 121 bln euros in bonds in 2013, 8% more than last year. Even if Spain’s undercapitalized banks used every one of the 100 bln in bailout funds to buy Spain bonds, that still wouldn’t be enough. These bonds come with a CAC, collective action clause, meaning that 66% of bond owners (again, most likely to be Spanish government entities or banks) can force haircuts on the others. Who else would buy these bonds besides the ECB? The economy isn’t improving, so assume more of the same periodic bouts of uncertainty about whether it gets cash it can’t repay, until it does. Hard to see German and Dutch taxpayers accepting this forever, but timing the breaking point is impossible. Given the contagion risks if a Greek default sends Spain bond yields spiking, Greece contagion “protection money” payoffs are acceptable for now, especially if paid for with extra printed money, for as long as the EUR continues to hold its value. Suffering from the same economic stagnation as the other GIIPS, and its situation thus far has been tied to Spain. When markets are nervous about Spain, Italian bonds and stocks also sell off. That makes Spain even more dangerous, it threatens Italy, and ironically what causes to believe Spain will be rescued, regardless of what happens. What other choice is there? Indeed, but at what price? A diluted Euro? A huge haircut to GIIPS bondholders? So here are the conclusions. Another EU scare is coming, the only question is when, and who pays for it. The least immediately painful approach is to print Euros, so a diluted EUR is at least part of the likely outcome. Japan, the US and China all recognize the contagion threat, and so can be counted on to attempt another intervention that threatens to further debase their own currencies. Risk assets like stock indexes are near decade highs, suggesting we’re near the end of a bull market cycle within a secular bear market. That alone would suggest the EUR is going lower versus the safer USD, JPY, and CHF. b. EUR weakness benefits the USD most, as we’ve discussed repeatedly, and in more depth in my book mentioned below. Currencies (and assets bound to them) of fiscally responsible nations, like the CAD, SEK, and NOK, among others. Gold and selected other hard assets. For those needing steady income, and are investing cash they don’t need to tap, the best choice of less than ideal set of options recommend a basket of solid dividend stocks that provide steady income diversified the above mentioned currencies. As always, we warn readers that just as any prudent investor diversifies into different asset and sector classes, so too they need to diversify their currency exposure. You don’t need to open brokerage accounts all over the world, or engage in high risk, complex forex trading. You do need to understand the range of safer, simpler, smarter ways to get that diversification. 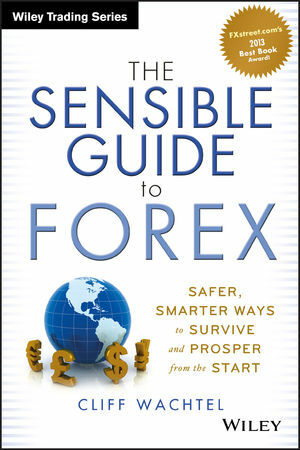 To help you with that, I’ve written the only collection of forex solutions for mainstream risk averse investors and traders, The Sensible Guide To Forex, Safer, Smarter Ways To Survive And Prosper From The Start. To learn more about it, visit thesensibleguidetoforex.com. See the About page for a full description of the book, and the Reviews page for advanced reviews.